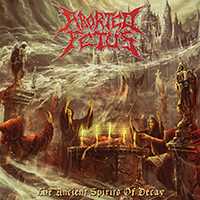 “The Ancient Spirits of Decay” is the sixth full-length album from ABORTED FETUS, a Russian brutal death metal band formed in 2000 who describe their music as “Ural Massive Brutality”. The album is set to release on May 11, and, in my humble opinion, this is the best release of 2018 thus far. The songs touch on many different styles; the album as a whole is essentially an amalgamation of the last 40 years of death metal. The album begins with an intro track, “The Wind of Agonizing Spirits”. It is a typical death metal intro, with a bass line that immediately reminded me of “Wherever I May Roam” by Metallica. 1:53 in, the lead guitar unexpectedly enters, breaking the mold of the modern death metal intro track. While I appreciate the change, the leads themselves seem unnecessary; in a way, it fits the feel of the song, but I think the intro itself would have been better off without it. The leads are reminiscent of classic old school death metal/thrash leads: shred but sloppy. The intro ends with the lead wavering between an A and A-flat over the tonic B, giving the ending an eeriness that keeps me interested enough to give the next song a try. After this intro track, the second song of the album gives a completely different vibe. To be perfectly honest, the album could have opened with this song; it would have made a much bigger impact if the intro track had just been scrapped altogether. “Eaten by Pigs in the Trough” immediately blasts in with a riff that is simple but catchy, and it immediately pulls you in. The quality of the production immediately stands out. Sergey Shchapov’s bass tone is thick and rich, and Alexander ‘Meatgrinder’ Andreev’s guitars have a super crunchy tone that perfectly suits the genre, and the kick drum is clicky while the snare has a perfect crack to it – everything death metal drums should be. It feels as though every instrument has room to breathe while meshing with each other, The album was mixed and mastered by Alexander Borovykh, head of Tsun Tsun Productions. Mr. Borovykh has also worked on brutal death metal giants such as BIGOT’s “Interrupted Pregnancy”, CARNOPHAGE’s “MONUMENT”, several EPICARDIECTOMY albums, and TRAUMATOMY’s “Monolith of Absolute Suffering” and “Embodiment of Excruciation”. He also mixed and mastered ABORTED FETUS’ 2017 album, “The Art of Violent Torture”. The impeccable production on “The Ancient Spirits of Decay” is what really sets it apart from other modern death metal albums. “Eaten by Pigs in the Trough” is immediately reminiscent of early MORBID ANGEL and CANNIBAL CORPSE – with better production. The vocals on this album are an interesting combination of super rich gutturals at times and, at other times, a higher, fry overtone that almost sounds like something is stuck in the vocalist’s throat. This is not necessarily a bad thing; Igor Stafeev has a very distinct vocal style. In a time when deathcore fry vocals and trashcan slam vocals are the norm (this is also not a bad thing, just the trends in death metal right now), Igor is a vocalist that can be easily identified, and I think that’s a crucial quality to have in a death metal vocalist. The song itself, and every song on this album for that matter, is full of simple but extremely catchy riffs. In the riff that enters at 0:37, the guitars sound off-beat, but this is the only time during the album where this happens. It may or may not have been intentional, but either way, for a straightforward riff such as this, the guitars have to be spot-on. The song continues with equally catchy riffs that continually punch you in the face (aurally). The lead guitar at 2:30 is noticeably short, as are many solos on this album, but, again, it is old school and somewhat sloppy. At 3:00, there is a great, smooth transition into the heavier section; this is a nice deviation from the pattern in the rest of this song of halting everything before moving on to the next riff. Again, I absolutely believe the album should have just opened with this hard-hitting song. “Drenched Eyes in Boiling Water” opens with a drum fill that brought the word “gorgeous” to mind. The toms and overall drum sound are so full and well-balanced, another testament to Alexander Borovykh’s experience and skill. This song also confirms that this band knows how to write a catchy riff better than many other active death metal bands. The riffs are simple, but they always draw you in and switch up the rhythmic qualities enough to keep it interesting. One of these riffs, with its blast beats and descending minor 2nd intervals, are again extremely reminiscent of early MORBID ANGEL. The guitar solo for this song is the first indicator of a common pattern throughout this album: the guitar solos are often split into two or three shorter sections. This is a great deviation from normal death metal solos, and it’s quite innovative. I just wish the shreddier parts were not as sloppy as they are, although this solo had a clear structure and was more like a short, sweet kick in the face; this was one of the solos I did not feel was unnecessary. For any fans of old school death metal, this modern take is a breath of fresh air. “Nailed to the Cross” is another scorcher; it jumps right in with another catchy, hard-hitting riff. This is also one of the three songs that have currently been released, with a music video that can be found HERE. This song has a much more modern brutal death metal feel than other songs on the album, although there are riffs on this song that are reminiscent of CANNIBAL CORPSE. Again, the solo is split up, this time into three small sections. The second part of the solo was enjoyable to listen to: this part had a clear structure and suited the song well, although the different sections of these solos seem almost obscenely short, sometimes only 4 measures at a time. The song ends on a super brutal, almost slam, riff, and this was a great way to end the song that set it apart from other songs on the album. At some point in every song, I marvel at how greatly the drums were mixed. A song can be great, but if one part of the mix overpowers another or if the drums are weak, it can ruin a good song. In the case of “The Ancient Spirits of Decay”, the mix works to enhance the song and makes every aspect heard clearly. “Beheaded on the Guillotine” is a run-of-the-mill death metal song with old school flair: it would not take much imagination for one to imagine David Vincent’s vocals over this song. “Cradle of Revulsion” is the third and last pre-released track. It immediately draws you in, and it sets itself apart from all of the other songs on the album. It begins with a slow, ominous, BLACK SABBATH-esque doom riff. This song serves as a great palate cleanser towards the middle of the album. After this fantastic opener, the song goes straight into a pure brutal death metal riff that just rips your face off (in a positive way). In this song’s 6 minutes and 11 seconds, it spans four decades of death metal styles, and it is one of the highlights of the album. This also has one of the few solos that I really enjoyed; the first solo section suits the song well, and it clearly progresses and builds nicely. This song continues the pattern of two to three different solo sections. While I think this is a pretty innovative move, some of these lead sections really do not do anything to serve the song. “Cold Lake of the Sinner” brings the album back to where the band seems to be most comfortable: brutal death metal with heavy old school influences. The album so far is very catchy, with super distinct vocals and periodic flairs of different metal styles, and this song continues the trend. 2:34-2:45 is a straight up modern hard rock riff; it’s unexpected, and it’s a nice break from the prevailing stylistic qualities. This riff sounds like something MEGADETH would write. I love when songs surprise me, and this one of the several songs on this album do so. This song is another highlight of the album. “Flame of Death” is one of the two instrumental tracks on the album. Clocking in at just less than a minute, the chord progression is dissonant at times, yet hauntingly beautiful. I’m a sucker for 9th chords, and this song incorporates them in a way that is unexpected from a brutal death metal band. As far as instrumental tracks go, both of the ones on this album are 10/10. This one progresses nicely, and it doesn’t drag, as some instrumentals tend to. “Rack of Torment” is a punishing, driving force. It opens with a brutal death metal, slammy riff. Again, it is simple but extremely catchy. When the riff returns after the guitar solo, there are no old school elements in sight; this is pure brutal slamming death metal. This song is pure aggression. The song progresses and builds throughout the third minute, reaching what you think is the climax at 3:40, then reaching its maximum-intensity climax at 3:55-4:00, finally releasing into another simple catchy riff that keeps you invested. The song ends on the guitar solo, and while it is like the other solos on this album, I’ve come to expect the style by now, and it is a good way to end the song. “Roasted Alive in the Copper Bull’s Stomach” left me speechless. The first thirty seconds is pure slam, broken up by a MORBID ANGEL-esque section. I found myself anticipating and wishing for the slam style to return. It is another pure, aggressive punch in the face of slamming brutality. At 2:55, there is a feel change that is still slam but adds a much-welcomed groove, and it elevates the song even further. This is what I classify as a 10/10 song. This has everything you could want from a song, except perhaps better-executed solos. I enjoyed the solos on this song though: I loved how they were framed by small sections with these nasty, guttural vocals (“nasty” meant with a completely positive connotation). “Genital Torture by the Alligator Tongs” has an unexpected but welcome clean intro, with classic brutal death metal riffs to follow. This is one of the songs where you notice Sergey ‘Hammer’ Kulakov’s footwork with the blazing double kick. At 3:10, there is a feel change to a pure thrash riff with drums matching the feel, bringing a fun atmosphere to counter the foreboding but aurally pleasing intro and the pure evil of the previous riff. Something else that I appreciate about this album is that the songs don’t always resolve. It adds a whole other level of interest to the song at the very end that is normally missing from a song that resolves to the tonic. “Iron Petals of the Blasphemer’s Pear” gets straight to the point, opening with pure, brutal death metal chaos. This second half of the album proves to be significantly different in terms of style than the first half. It incorporates much more slam elements, this song included, with another catchy as hell thrash riff for good measure. This is another song that progresses and builds beautifully. The second minute of this song is the part of the album where Igor’s vocals really shine. The third minute of this song could be purely a thrash song, until a sudden change at 3:37. This change is one of the highlights of the album: it’s unlike anything else you’ll hear here and is one of the more technical parts of the album. The vocals stay in the more guttural area, and Igor is at his best on this track. “Follow Into the Darkness” is the last track and the second instrumental one. This is another highlight of the album – another clean, haunting but beautiful, aurally pleasing progression. The change at 0:55 is one of the best parts of the album. Again, “gorgeous” is the only word that came to mind. It is a heart-wrenching ending to the album, and my only complaint is that I wanted this track to last longer. This is arguably the best instrumental outro on any death metal album. I was initially wary about the length of this album. Most albums with more than 8 or 9 tracks tend to drag, and I know many death metal fans who have trouble sitting through long albums such as this. I never felt that this album dragged. The entire album incorporated so many different styles at different points that it will keep you invested the entire way through. While there is something to be said about always going back to that old school, MORBID ANGEL/CANNIBAL CORPSE STYLE, it seemed to happen between every riff that strayed. It made me long to hear the slamming brutal sections that this band can obviously excel at. The instrumental tracks are highlights of the album, a refreshing contrast to the pure evil aggression that this band can conjure. The guitar solos were my biggest qualms with this album. Stylistically, at times they felt like the death metal version of Kirk Hammett solos. While there are a few enjoyable solos, I felt that a lot of them just did not do much to serve the songs. But damn, these guys know how to write a riff. A lot of the riffs were simple, in-your-face, catchy as hell riffs. I would recommend this album to anyone who likes any form of death metal; it is so varied in its styles. This is without a doubt the best album of 2018 so far.